Professor Ralph Lee standing with the first Missouri S&T computer, an LPG-30 or Librascope Precision General computer. Professor of Mathematics, Dr. Ralph Lee, taught the first Missouri S&T (then MSM) computer class in 1957. He established the campus computer center in the 1959-60 academic year. 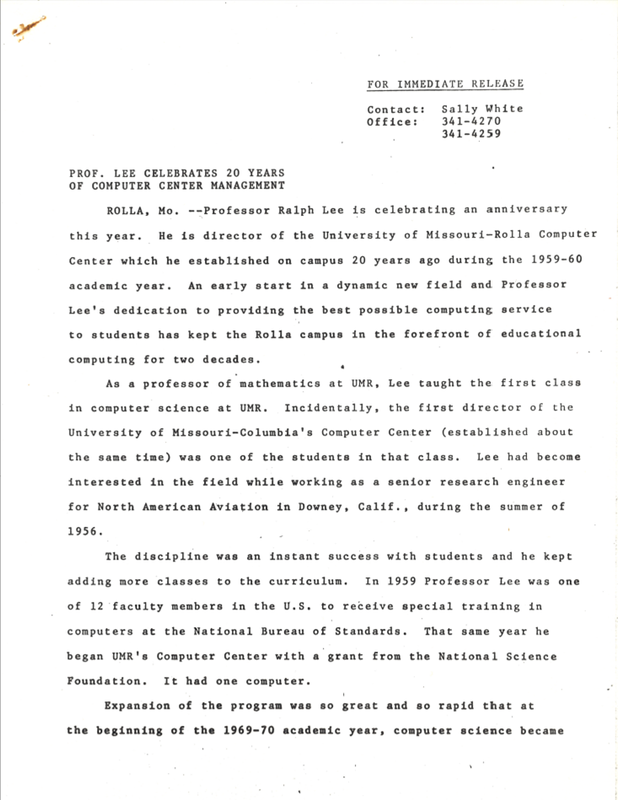 A press release, likely from 1979, celebrates Dr. Lee’s 20th anniversary as director of the computer center. Here are some highlights from that press release. 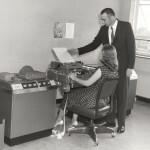 Lee became interested in computers while working as a senior research engineer for North American Aviation in Downey, CA during the summer of 1956. 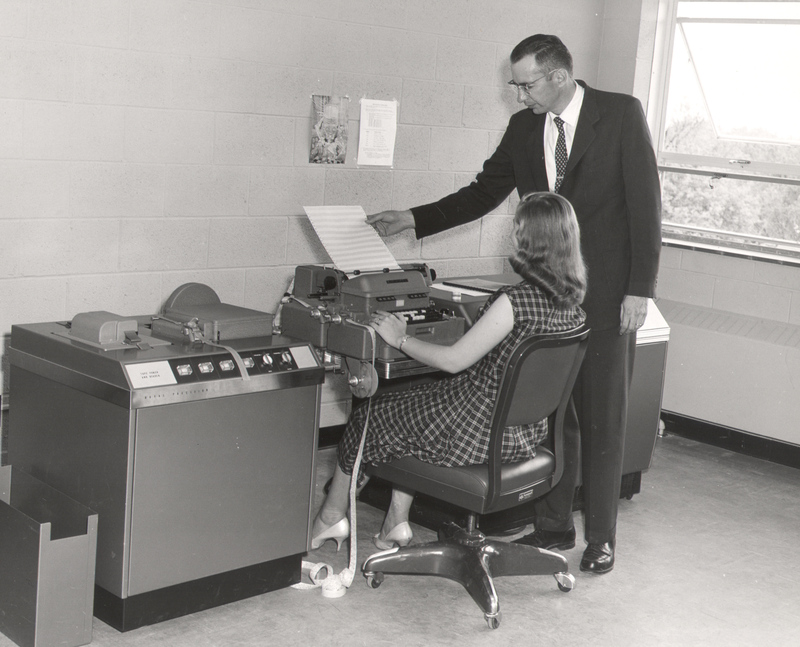 One of Dr. Lee’s students in the 1957 computer class in Rolla became the first director of the Mizzou computing center in Columbia. In 1959, Professor Lee was one of 12 faculty members in the United States to receive special training in computers at the National Bureau of Standards. 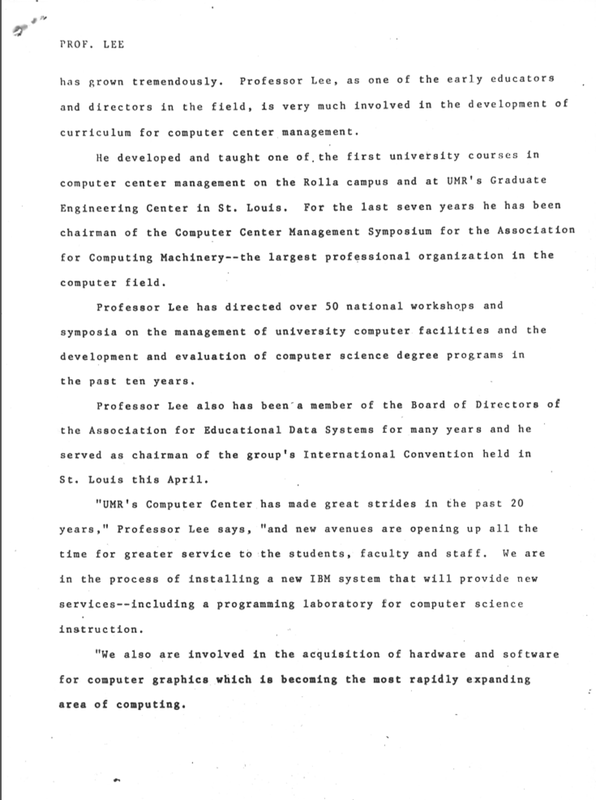 By the time of the press release, Dr. Lee had been the chairman of the Computer Center Management Symposium for the Association of Computing Machinery for seven years. In the ten years prior, he had also conducted over 50 national workshops and symposia on the management of university computer facilities, and the development and evaluation of computer science degree programs. 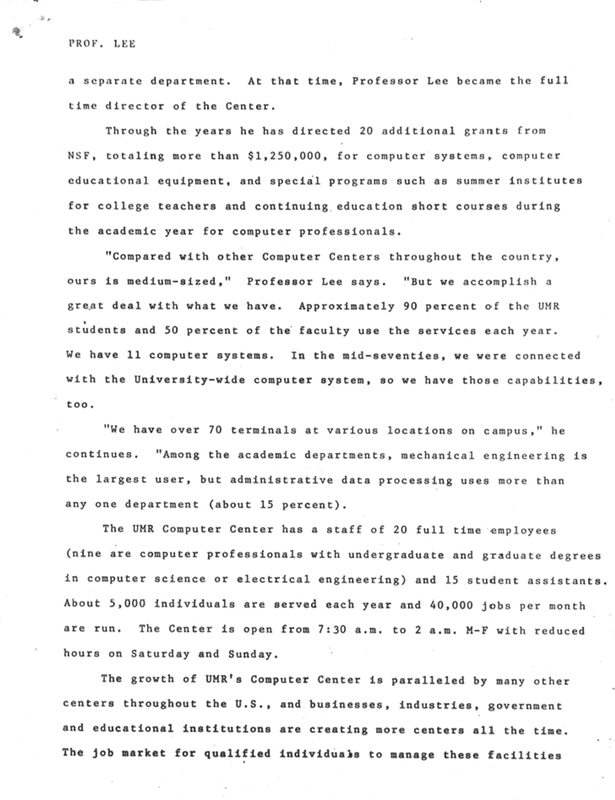 The computing center was established in 1959 with a grant from the National Science Foundation with one computer. The press release doesn’t mention what computer, but other sources indicate the first computer was an LGP-30, a Librascope General Precision computer. The campus had 11 computers and 70 terminals, as well as access to computers at the other University of Missouri campuses. Approximately 90% of the students and 50% of the faculty used the services. Mechanical Engineering was the largest academic user, but administrative data processing accounted for more usage (about 15%) than any one department. The computer center had 20 full time employees and 15 student assistants. The center ran about 40,000 jobs per month. You can read the complete press release below.